A product is only as good as it's design and engineering. Swagtron Hoverboard had a long research and design period to produce the safe, well-thought-out product that it is today. Let’s examine some of the qualities that make the Swagtron Hoverboard a very popular choice among self-balancing hoverboards. Lithium ion is largely replacing the lead acid batteries that debuted in the mid-nineteenth century, as well as more modern lead acid and NiCad batteries. Lithium ion has quite a few advantages for Swagtron users. When the battery is charged, nearly 100% of the battery power is available, and it will lose very little of that capacity over time. Even after many charging cycles, there’s little loss of steady, usable voltage. Especially important for Swagtron owners is that the battery takes a fast full charge, but if you’re very eager to get back on the road, a partial charge will not damage the battery. You can also leave it uncharged for extended periods without damage, but who abandons their Swagtron for very long? No matter where you live, Swagtron’s Hoverboard lithium ion battery holds up well, even in extremely hot or cold environments with practically zero maintenance. One disadvantage of the lithium ion battery is that earlier versions could be flammable. More recent lithium ion batteries have a slightly different chemical makeup that addresses that issue. In addition, Swagtron’s Sentry-Shield battery compartment is an extremely tough, completely sealed aluminum alloy case. It makes sure that your body doesn’t get exposed to too much heat from the battery. It also ensures that you won’t overcharge your battery. Swagtron Hoverboard is the first hands-free smart board to receive the Underwriters Laboratories’ UL2272 certification and seal for shock and fire hazards. That certification covers the electrical drive train, including the rechargeable battery and charger system. To ensure that your Swagtron Hoverboard reaches you safely, the Hoverboard has met the UN transportation testing certification UN38.3. That certification addresses the safety of lithium-ion batteries during shipping. The equipment is put through eight rigorous tests for altitude, heat, vibration, shock, external short circuit, impact, overcharge and forced discharge. Only after passing all of these tests is UN28.3 certification granted to the product. The extensive product safety engineering that went into the Swagtron is validated by these UL2272 and UN28.3 certifications. Swagtron Hoverboard weighs in as a lightweight at only 22 ½ pounds, measuring 23 inches wide by 4 inches high by 7 inches deep. It’s so compact that some users order an optional, form-fitting backpack carrier for the Swagtron to take it to school or work. 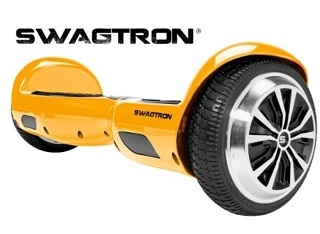 Swagtron’s rider weight guidelines are 44 pounds minimum to 220 pounds maximum. This Hoverboard can travel 2-8 mph for up to 20 miles per charge. Of course, the speed and distance vary according to the rider’s weight and type of riding being done. Swagtron Hoverboard has improved traction and control for power hoverboards. The aluminum wheels and rubber tires provide the hoverboards traction. It’s open wheels, which allow excellent wheel clearance, help provide good control for your moves. Swagtron’s hard ABS body and silicone coating resists moisture as well as heat, so get out and ride!